My previous article, which indulged in bit of nostalgia about grade school lunches, missed much of the actual drama that put Hostess, the maker of Twinkies, Ho-Ho’s, and Ding Dongs, on the ropes. It isn’t quite over . A USA Today article by Kevin McCoy reports that Hostess management and the baker’s union are meeting for mediation today, delaying the company’s second bankruptcy filing in less than a decade http://usat.ly/TU81SA. Bruce Maiman, a local contributor to the Sacramento Bee, interviewed workers striking at the local Hostess bakery who say their hourly wage and pensions are lower than other bakers like Oroweat and Sara Lee http://www.sacbee.com/2012/11/20/4998328/blame-workers-unions-or-the-executives.html. Maiman lists a string of gaffes by a management led by six different CEO’s in ten years. Local workers claim that rather than replacing outdated equipment, money was recently spent to replace windows and paint the lunchroom, locker room, and floors. “They want it to look pretty so they can sell it,” says the head of the local baker’s union. Selling assets may well be the outcome. US Bankruptcy Trustee, Tracy Hope Davis, joined the union in arguing against management’s current shutdown plans – which among other things, would grant them large bonuses. Davis favors Chapter 7 bankruptcy, which would liquidate assets according to US Bankruptcy Code priorities. This entry was posted in Current Events, News and tagged 2012, current events, Hostess Twinkies, Labor relations, News. Bookmark the permalink. 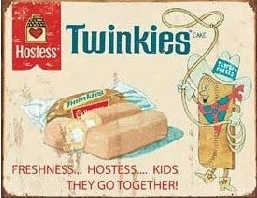 I think there’s a much better chance of running out of Twinkies before running out of nitwits. Thanks for the update. I think you’re right about the persistence of nitwits!